VPC members Charles and Graham chatting. In the foreground, you can see Graham's Ink Sample Vial Holder from GouletPens.com . Photo by Glenn M.
Maja's selection of pens brought in for the evening's theme- "Made in Canada". How many of them can *you* name? (click on image to enlarge). Photo by Glenn M.
We had good attendance at the July meeting, which was held at the Vancouver Public Library's Oakridge branch. 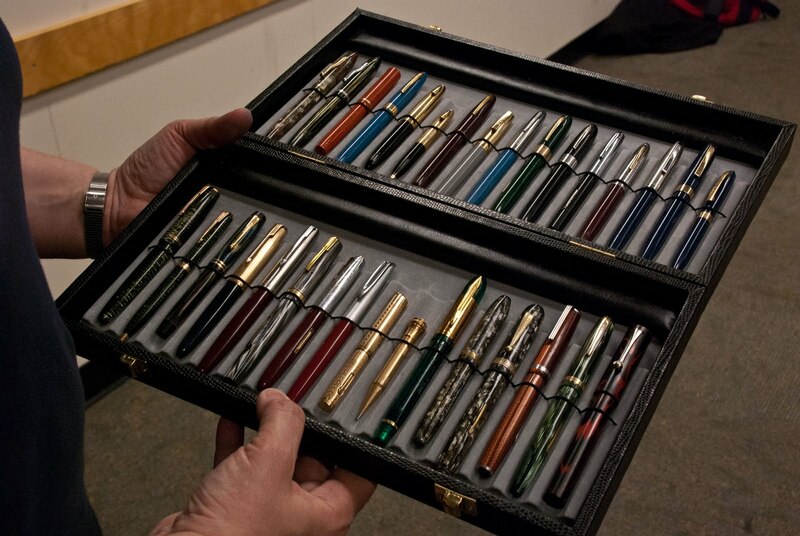 Nineteen members in total showed up with writing instruments that matched the meeting topic/theme, as well as inks for the Ink Swap. Our August meeting will be the annual summer dinner for VPC members (info in the group email sent to VPC members). Update: Thanks to all VPC members who RSVP'd to reserve a seat--we're all booked up now! Regular (themed) meetings will resume on September 15 at Perks pen store at 5844 Cambie Street (our usual place). 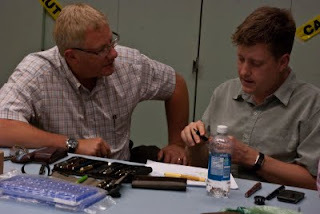 The September meeting theme will be Japanese Pens. Please check our website for any updates..